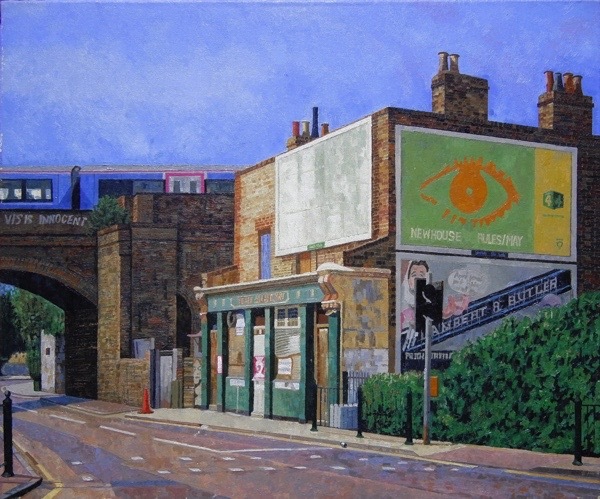 It is my pleasure to publish this selection of the remarkable paintings and drawings created by Doreen Fletcher in the East End between 1983 and 2003, seen publicly for the very first time. “I was discouraged by the lack of interest,” admitted Doreen to me plainly, explaining why she gave up after twenty years of doing this work. For the past decade, all these pictures have sat in Doreen’s attic until I persuaded her to take them out yesterday and let me photograph them for publication here. For twenty years, Doreen conscientiously sent off transparencies of her pictures to galleries, magazines and competitions, only to receive universal rejection. As a consequence, she forsook her artwork entirely in 2003 and took a managerial job, and did no painting for the next ten years. But eventually, Doreen had enough of this too and has recently rediscovered her exceptional forgotten talent. 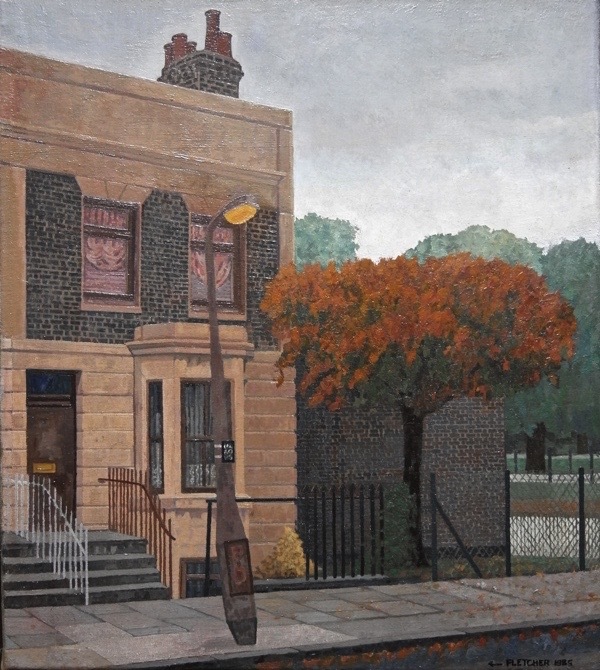 Many of Doreen’s pictures exist as the only record of places that have long gone and I publish her work today in the hope that she will now receive the recognition she deserves, not just for outstanding quality of her painting but also for her brave perseverance in pursuing her clear-eyed vision of the East End in spite of the lack of any interest or support. I love this work. I would buy Hairdresser or Rene’s Cafe if I saw it in a gallery! Great work, I particularly loved “Bartlett Park”. I think she should keep painting! The lack of recognition for these paintings says more about the ‘bizarre’ outlook of the art critics than it dose about the quality of the work, they are so good I genuinely thought they were photos at first, the painting of the Albion pub near Mile End stadium is a remarkable coincidence for me as only a few days ago I noticed they are starting a new construction on the site where it stood and I was trying to find a photo of the old pub but was unable to find one, I find it very pleasing that such a wealth of hidden talent has at last been unearthed and now made available for the appreciation of a much larger audience, EXCELLENT work ALL ROUND. Thank you for encouraging this artist to share her work with you so that we too could see it. She is indeed talented. I have worked many years as a graphic designer and these painting look like the work of a skilled illustrator and artist. I can’t understand why this work was not snapped up by numerous sources. I think her work is lovely. These are amazing. Thank you so much for photographing and sharing them. Dear Doreen, your work is delightful. I am sorry to read that it has languished, unappreciated, in an attic for so many years. You deserve a solo exhibition. Please continue painting! These are delightful. I lived and worked in the City and part of the East End from 1979 to 1996 and was aware that many changes happened during that period. Almost unobserved, boarded-up bomb-sites became office blocks as the greedy, moneyed 1980s emerged – shouted and clattered, then subsided as the economy expired. The silence of Black Wednesday still resonates, a warning to those who rely on balloons, not foundations. When I go back and visit London, it seems a whole new world has been superimposed upon the images in my minds’ eye. Exciting and fascinating. The places through which I wandered were N1, E8 and E5 (Islington, London Fields and Hackney) – Whitechapel and Spitalfields were less familiar. Doreen has beautifully captured the faded, forlorn and forgotten. Thank you, Gentle Author for seeking them out for the enjoyment of others. I now live in Scotland, but every morning I turn to this blog and indulge in a journey. It is a pleasing thing to do. What an interesting eye she has. And though the details are meticulous, the paintings are so much than just documents—they’re deeply felt. I hope this post will lead to her getting the attention she deserves. These are just stunning! So glad you have given them an outing here, and I hope they have a remarkable future. And please will you keep us informed of their progress? Oh how grateful I am that you have given us all these marvellous pictures. There should be a book, prints,an exhibition. Thank you. I have long despaired of the art market…seems purely mercenary in the main. What gems you have uncovered here, gentle author. Thanks to you I’m sure this hugely talented artist, Doreen Fletcher, will now get the recognition she deserves. I’ll be watching. What a stunning collection of pictures, so atmospheric and beautifully painted. Will they be exhibited of dare I ask for sale!? I hope this talented painter finds a market now. The changing demographic of East London with the increasing influx of young artistically engaged people might help. 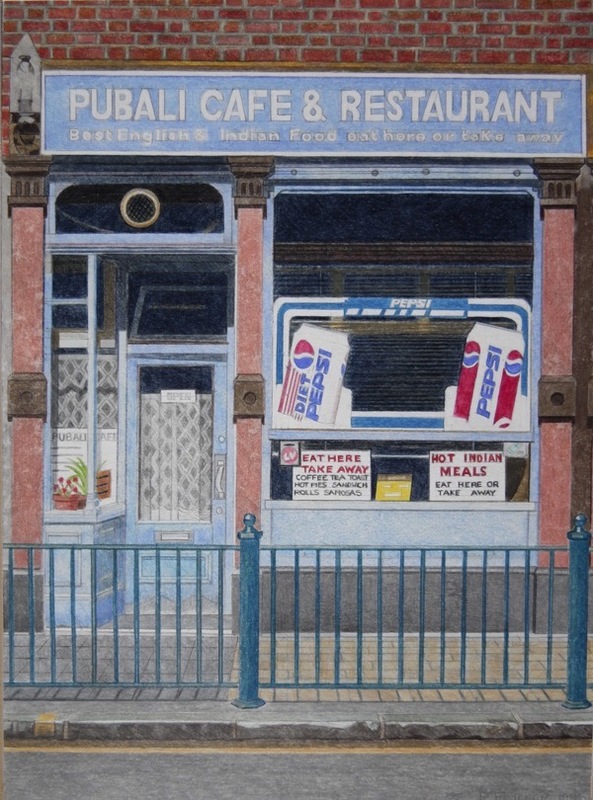 The work could also appeal to born and bred East Enders with a bob or two to spare. The influence of Hopper is very clear but there is originality in the approach to the subject matter. Wonderful, marvellous pictures – DO NOT put them back in the loft! I think these drawings are fantastic. They have a certain quality which captures that moment in time not so long ago which has all but disappeared Is there to be a run of prints? What a lovely way to begin a Saturday morning: with an unexpected exhibition of such evocative paintings. Many of them remind me of Walker Evans photographs. Doreen Fletcher must surely now get the recognition she deserves. These are amazing, I have seen so many glimpses into my locale across the years. Would be very interested in buying some. A unique sensibility, a treasure trove, Well done GA.
…also, they would make great cards and prints, all the best Doreen. These MUST be released to a wider audience. P.S. 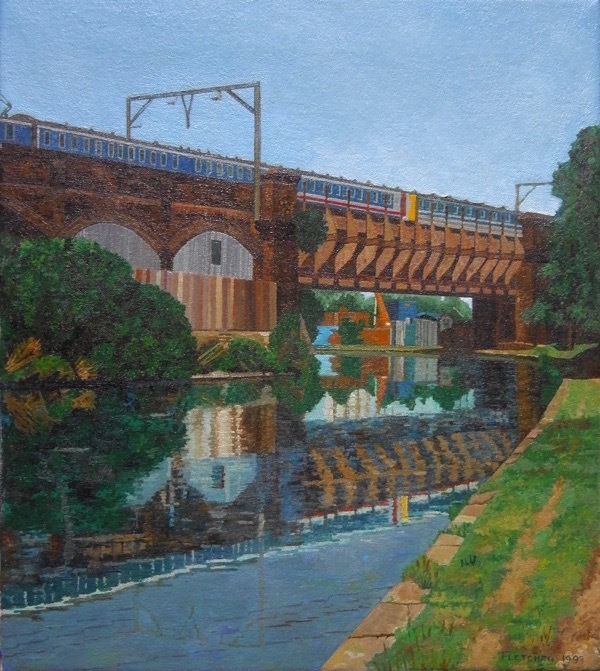 How much does she want for “Railway Bridge, 1990″ ?? Bravo for introducing Doreen’s work to your readership and, hopefully, to many other people. Her paintings are excellent: they invite immediate comparison with the work of people like Edward Hopper in her sensitivity to light and how it lends to apparently banal urban subjects a sense of mystery and grandeur that is, in fact, integral to the experience of living in cities but one of which most of us remain wholly unconscious. 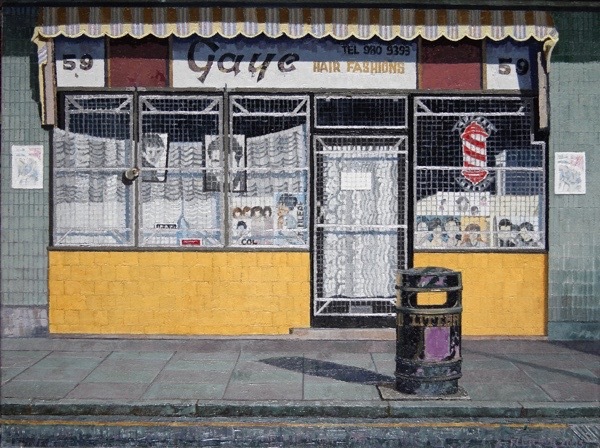 Her sense of design, too, is exceptional in the way she captures the complex patterning of urban surfaces in works such as ‘Newsagents, Canning Town.’ Fantastic work. Enchanted. I love the lack of pretension and careful attention to detail. I do hope they get curated and kept for future generations as a record of late 20th century life. Beautiful representations of vanishing communities. I really like the skilled eye of the artist and the photo realistic images. If I lived in the area I would snap one up. Artworks in their own right. I think Ms Fletcher should return to her art and use her skills to enhance her East End communities and establish herself in the local record. Important work, to be enjoyed and treasured for the future. 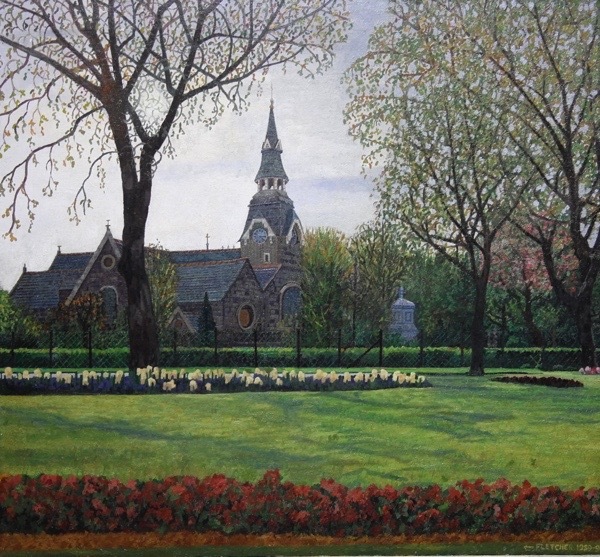 It’s wonderful that you have discovered Doreen’s work and that she has started painting again. Hopefully her paintings will be shown in a gallery soon – very many artists have the same problems of rejection – you just have to keep going. The paintings are great – look forward to seeing them in a gallery! What a wonderful start to the weekend! These pictures bought my childhood flooding back. I would love to go to an exhibition of these. Well done Doteen and well done GA for seeking them out. Astonishing work, Doreen. Please keep painting and please, please have an exhibition……soon ! Beautiful. Thank you for sharing them with us. 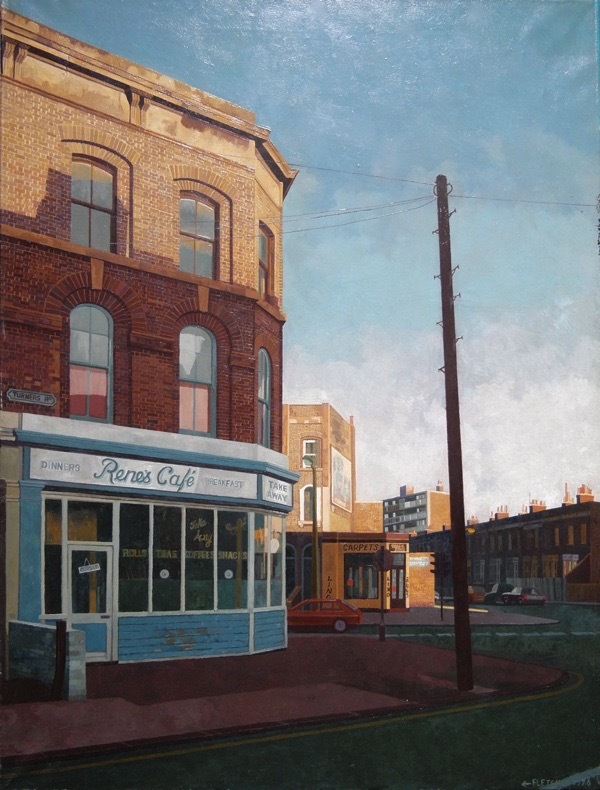 I am astounded that Doreen Fletcher’s work has been ignored by galleries and publishers; these are superb paintings and drawings, created with tremendous skill and sensitivity. If it was the everyday subject-matter that did not appeal to promoters of the arts 20 years ago, I feel sure that would not be the case today. The wonderful bleakness of Bartlett Park is akin to the work of George Shaw – who was shortlisted for the Turner Prize in 2011. 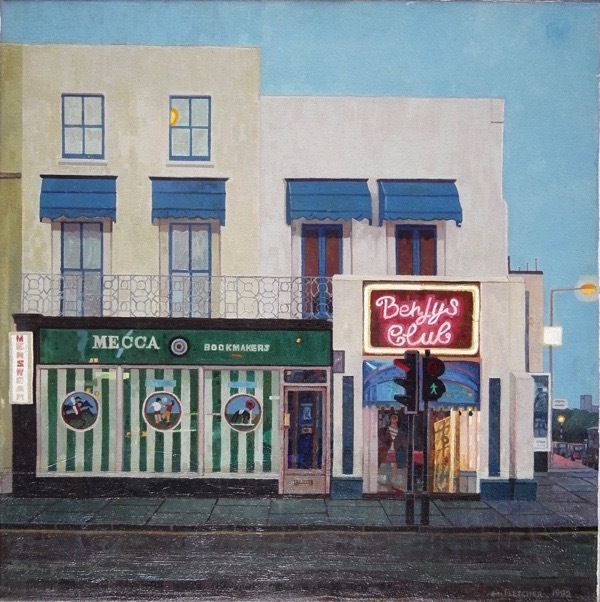 Fletcher’s carefully observed buildings and streets, invested with a delicious tang of poignancy, carry the baton of the East London Group in the 1930s and are similar in spirit to Edward Hopper and Jock McFadyen. 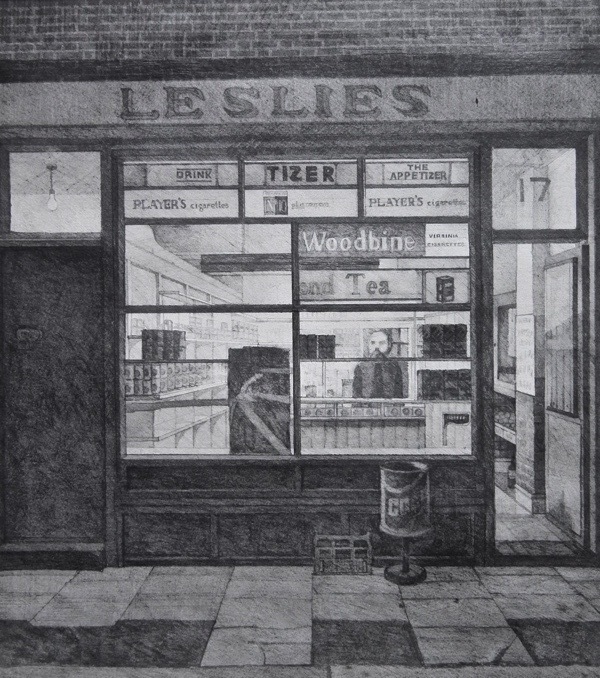 I also admire her precise use of distant figures: separated by street furniture in Mile End, striding in Turner’s Road, staring from the window of the Terminus Restaurant – and the disembodied legs seen through the doorway of a launderette. This is truly marvellous work. An exhibition at The Townhouse in Fournier Street, for example, would be a knock-out. And a book would be absolutely stunning. Wonderful! Through bad luck Doreen has them all – a complete body of work ready for exhibition. My instinct is to keep them together. I’d love to see more in the future. These pictures are amazing in their clarity and sense of time and place. It’s almost unbelievable that they met with indifference from the art world. i hope Doreen continues with her work. Thank you for bringing these pictures to light. Love your blog, GA, even though I am not a Londoner and have no personal knowledge of the East End. They are remarkable. They have something of the atmosphere of Hopper. I love them . I used to buy a painting every time I had a book published but the price of paintings went up and that of author’s advances down so not lately. I would happily buy one of these though if Doreen is selling ( and I could afford it) – and she could have it back for the solo exhibition which I feel confident will take place soon. Wonderful paintings & drawings, such a talent. 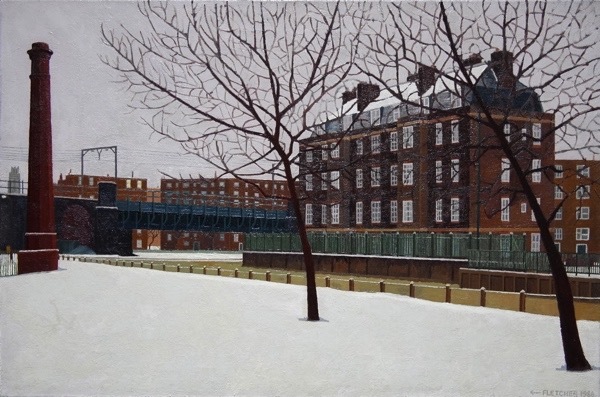 I was living in the flats (Galsworthy House, Carr Street) depicted in ‘Snow in Mile End Park, 1986′ , when it was painted, and until they were demolished in 1999. I probably saw Doreen painting it! I would buy it if it was for sale. They are all wonderful. Thank you for sharing, Gentle Author! It would indeed be wonderful to see an exhibition, a book, prints, and cards. So glad that you kept these fantastic paintings, Doreen, and hope that you continue painting our now rapidly changing Cityscape. PS I love Rene’s Cafe and St Matthias’s Church! Another astonishing treasure brought to light. Doreen is extremely talented. Could someone please let us know if these are watercolors? A few at the end say the media (pencil, colored crayon) but most of them are unidentified as to media. The Gentle Author’s discoveries have been a highlight of every day now for months. I’m an artist in St. Louis who is an East Ender in heart. Doreen, what a talent you are! I hope there will be an exhibition and book of your work….and that you have returned full-time to your obvious joy–painting! The lighting, composition, choice of subject–all spectacular. Reading the comments above, Doreen, you have a “Sold Out” show already! Thanks, Gentle Author, for providing this online gallery of wonder. Wonderful work! Well done GA for recognising their worth and bringing them out into the light again! I hope this encourages Doreen to continue recording ‘ordinary’ buildings and helping us to see their special character. Thanks for publishing these pictures. They just go to show that various gallery owners et al got it so very wrong all these years. But what do the critics know anyway? Hope Doreen receives the recognition she so obviously deserves now. Would like to know their dimensions. Remarkable! She needs an agent/gallerist. Truly astonishing find! I love this work. 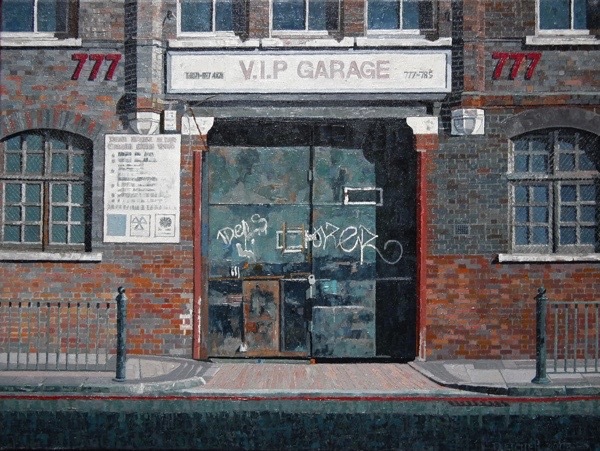 Beautiful detail and captures the essence of the East London I knew. I would buy these – perhaps you could arrange for a limited edition print run? Thank you GA for bringing Doreen’s work to our attention. What a talented lady Doreen is! I hope that this results in Doreen having that long overdue exhibition of her work made available to the wider public. 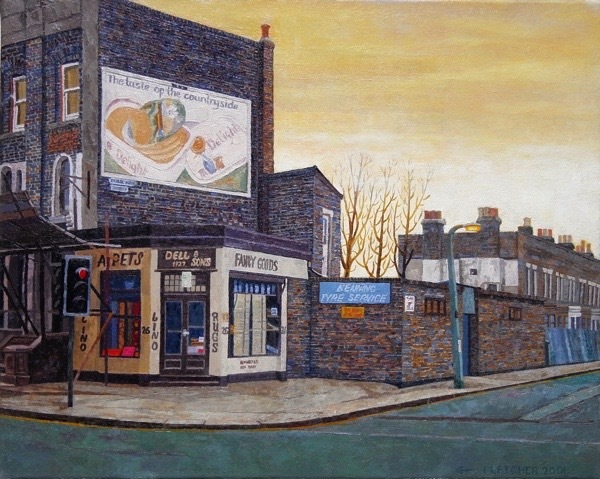 Doreen, please keep painting, you are such a talented lady and you capture the true essence of the East End. Wonderful work and story. How about putting them on Saatchi Online? Just brilliant. 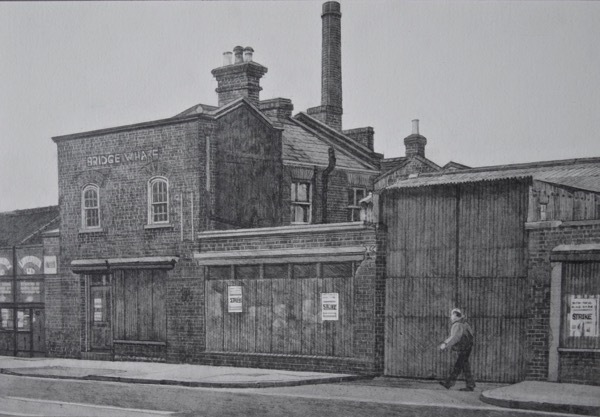 Go back to your art Doreen, and thank you for preserving these images of the East End. These are fabulous. Among many others here no doubt, I would love to acquire one or two. Thank goodness Doreen has started painting again! Fantastic. We met Doreen in France this Summer and loved her pictures so much that we had to have 2! Lovely to see her other work. These are stunning; this is the East London Group Mk2 – and now I hope Mk3 ! So much for agents and galleries. We want to buy (at least) one very soon. Good luck Doreen and thanks to GA for finding these gems. These pictures are fantastic, both the subjects and the artistry. Doreen, I’m so sorry no one recognized your talent and the value of documenting the East End. I hope you will now get the recognition you deserve. Gentle Author, thank you so much for making it possible for us to see the pictures! Brilliant… The brickwork detail is amazing. When you see the tripe that often passes as art nowadays (and makes the artist a fortune) and then see this artistry and hear that it has languished in a loft for years due to a lack of interest. It’s enough to make you weep. Another idea for a book, eh, GA? I hope Doreen finally gets the recognition she deserves. 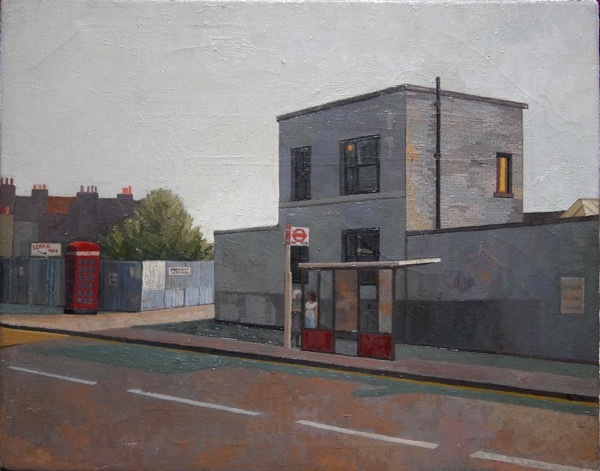 These are superb paintings, so evocative of the East End I used to know and barely recognise now, I would certainly buy more than one of these fine works if they were in an exhibition. 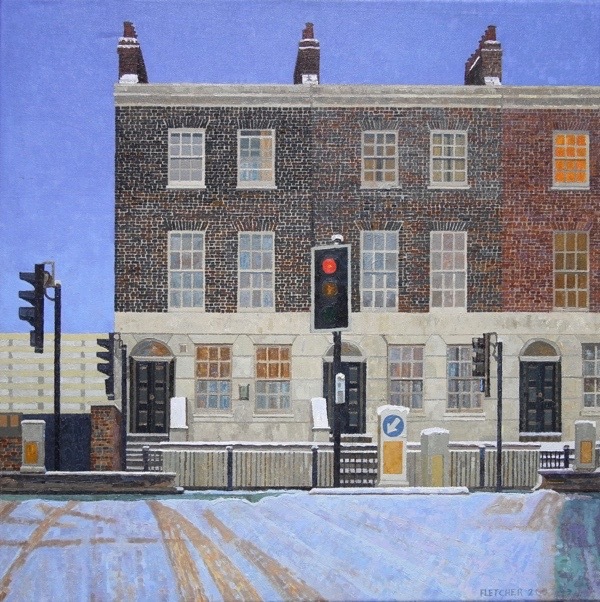 I hope that Doreen is encouraged enough by the reaction here on Spitalfields life to pick up her brushes and continue, obviously an exhibition and a book are are in order – hint hint. What talent Doreen has, these pictures are beautiful! I hope her skills as an artist are now finally recognised and she is able to pursue her dream. 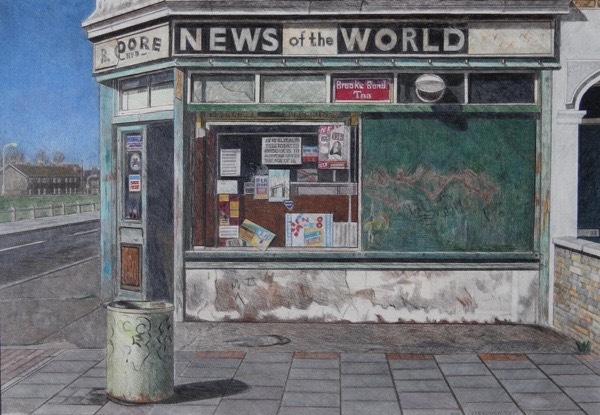 So talented, I can recognise most of the places having lived in the area for 25 years and I first thought that they were photographs….pics must be exhibited. I love the paintings if they ever go on display please let me know. best of all I love the one of the church, St. Matthias. I bet they will deffently be worth something now as its paintings of the past, nice memories, on how things used to be. Thank you for showing them to us all. Loved them all. My favourite has to be News of the World. A sad reminder of changing times !!! Took a second glance to make sure they were not photographs, they are so good. Doreen is a very talented artist, so it`s wonderful that these paintings are being given an audience after all this time. What wonderful work. Hope Doreen takes up where she left off. These pictures are absolutely lovely! I hope your publicity will lead to a gallery opening and a demand for Doreen Fletcher’s pictures and prints! Fantastic work Doreen. I am so pleased for you, this is just the beginning. Thank you G.A. for showing them to us. The Condemned House – so atmospheric. Loved these pictures. I’m sure they would sell like hot cakes. I am so excited to see these great images. Thank you so much Doreen and GA. I love the period feel of them and as an artist and urban sketcher myself, really appreciate these super works. As everyone has said, there must be an exhibition of these important records of the area. I feel privileged to have been able to see them and am so glad you are painting again Doreen. Don’t forget that doing art is the important thing for us! This situation is symptomatic of the art world today, utter rubbish is admired whilst real talent is despised. I hope that this artist will be encouraged by all the comments here, we all appreciate her work, and well done. Beautiful pictures. So evocative. Thank you. These are great. I lived on Locksley Street which joins onto Turners Rd between 1985 -86 and regularly went in the Albion pub, Rene’s Cafe and Leslies grocers. Most of Locksley St was sadly knocked down and I think the ‘condemned house’ was on that street. In the 1980s that area of London still had an old east end community feel though it was very neglected and many properties were boarded up. It was known locally as the ‘Locksley triangle’ (Clemence Road forming the other part of the triangle). I used to also go to the Prince Alfred pub on Locksley St (now closed) and the Marshal Keate pub in Poplar which was knocked down as part of docklands development. I’m sure Doreen would know these. Incredibly evocative work. Would love to see an exhibition of these. Many of these are truly excellent. So atmospheric – simple yet telling, and what a hugely talented painter. I hope there will be an exhibition. Surely their time has come. Are they for sale, perchance?? 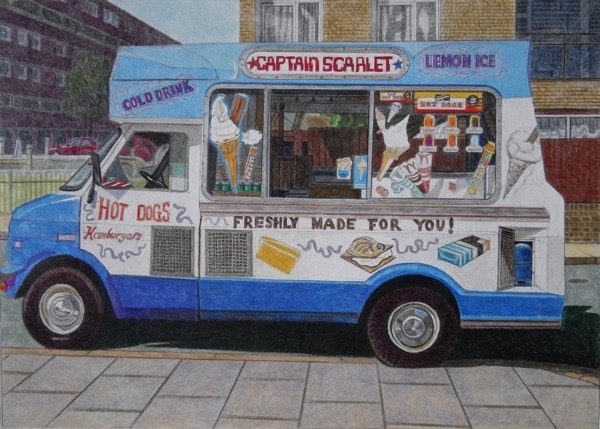 Thank you Spitalfields Life for sharing Doreen’s paintings with us. There’s real love in these intense pictures. Agree with all the other comments that really appreciate Doreen ‘s eye and talent and also your bringing these pictures to us. Thank you both. She is extraordinary. Many of these have an Edward Hopper feeling of loneliness that lifts the viewer away from the simple pictorial. Her detail work is remarkable. All in all, I agree that she should be added to my collection, as others have remarked for themselves. I hope this collection will secure a proper place for her in the appropriate London gallery. 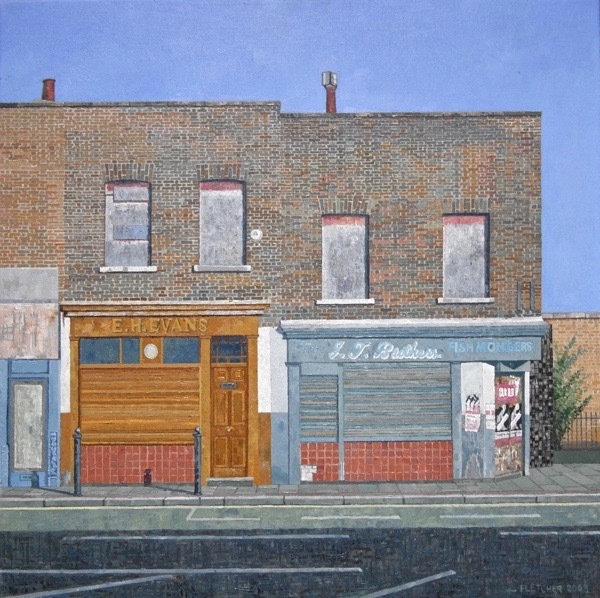 Thanks so much, Gentle Author and Spitalfields Life, for giving Doreen and her paintings a new space! My daughter has just emailed your article to me from New Zealand and we both love the paintings, as much for the beautiful perspectives (such as in ‘Turner’s Row’) as for the wry and economical observations of details such as graffiti daubed on the walls (‘FAWKES IS INNOCENT’ is class!) and little domestic touches, such as just the legs of a seated woman in the open doorway, perhaps of the manageress, in ‘Laundrette’. The collection is a lovely, varied, refreshing and affectionate collection of scenes of a special community dynamic which is perhaps not so evident now, which I so enjoyed, and a record of a simpler life – where do you see a laundrette these days advertising a ‘Daily Wash, Dry and Fold Service’ after all?! 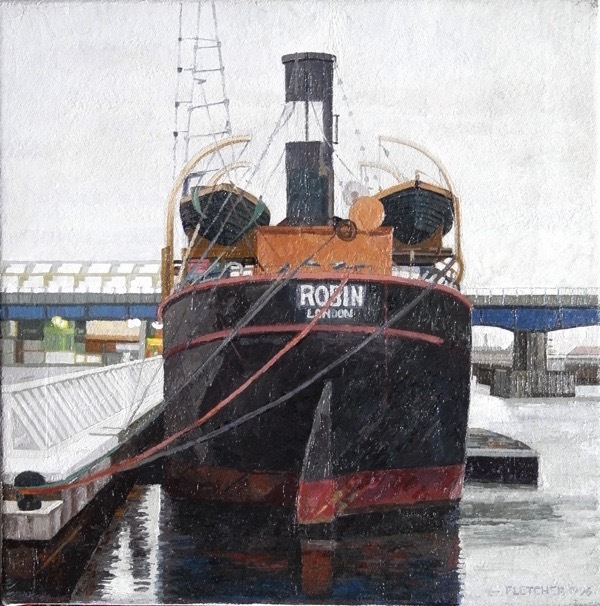 Thank you, Doreen, for allowing the sharing your lovely and evocative paintings! You can tell how much Doreen loves her subjects. These painting are beautifully observed and executed, and she has a wonderful sense of design. I love the patterning and her particular use of colour. Doreen must have sent her work to people who’d missed their appointments at Specsavers. This is a wonderful body of work that should receive the admiration and recognition it deserves. When and where is her first exhibition please? 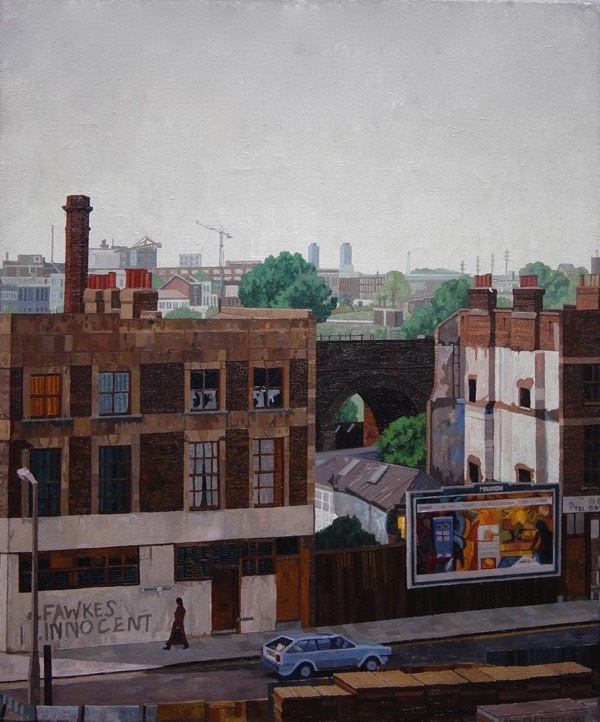 Further to my earlier post, Turner’s Road in Bow also seized the eye of Jock McFadyen RA, another artist drawn to the East End. His painting of a shuttered retail or industrial premises with railway arches beyond, dated 2000, is included in his splendid monograph ‘Jock McFadyen: A Book About a Painter’, by David Cohen, published by Lund Humphries in 2001. The front cover depicts a photo, including the street name, on which the painting was based. Doreen these pictures are fantastic, and for me also a great reminder of what that area used to look like when I loved there (Acme prefab off Conder Street). Thanks for putting on this show, I can’t wait to see them for real! It’s been a pleasure knowing you Doreen! These works of Art has revealed you’re unique talent. These paintings are absolutely amazing! They preserved the memories of these eatablishments. These are wonderful – I don’t understand why they never got the recognition they deserved at the time. Stunning. I love the variety and color of her skies. She captures the lonely wistful beauty of both the places and their time. As the juggernaut of digital imagery powers its way through our collective conscience; these images show that there is still a place for painting. As photographs they would only reveal in mechanical detail the changing face of the East End, however, as the gesture of Doreen’s hand and her intent, they carry an emotional charge, that triggers the punctum of those with a recent memory of the East End. Thanks so much for sharing these images. I taught for a short time in the East End in the early 1970s and many of these images bring back memories of that time. When do you think that the exhibition might be? The last week in May 2016 sounds a good time – I will be back in England that week! Remarkable! Any chance of prints, at leasts, being made of these? I would buy. I’m Commercial Rd born, but now in Canada – memories flooded back! I love this work – it’s a record of a disappearing world. 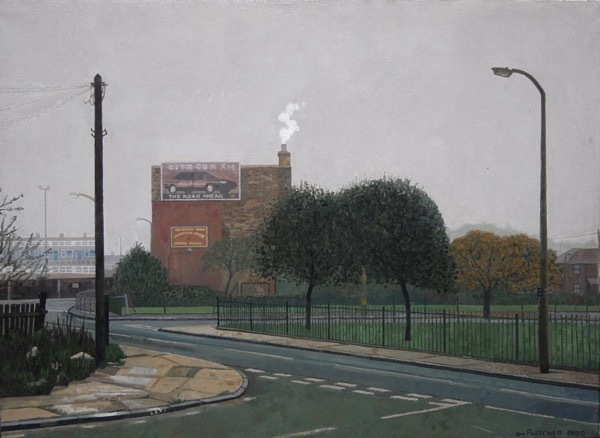 Wonderfully evocative, I was at school in Benjonson Road in 1983 and she has captured the feeling of emptiness of the area as it morphed out of those post war years. I saw/used most of these shops and places in this period and it really did feel that the patient was dying. There was still a lot of flat, bare, open space courtesy of the Luftwaffe and dilapidated terraces waiting for the bulldozer or gentrification. Looking at these pictures I can once again smell the Pubali Cafe in Limehouse and the smoked fish from the fish mongers in Commercial Road beside the little patch of bomb gone street (he also had a live eel tank!) and I can feel my feet sticking to the carpet in Benjys. These ought to be on sale. These paintings are stunning! I felt so much emotion looking at them. I have walked past most of these buildings and shops a hundred times in my past which brought them to life for me. keep painting Doreen Fletcher. I would love to see them in an exhibition someday. Are these for sale, I would love to own one. If they are please email me. Beautiful, rich, wistful work. Ignorant galleries. 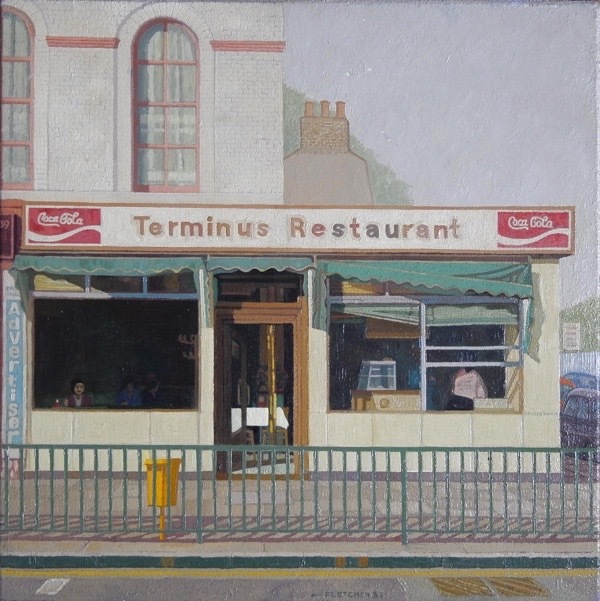 My wife’s parents owned the terminus restaurant in Mile End. At the time that painting was done. As my wife has no pictures of it and her parents have know passed away. Would there be by any chance we ca purchase it or get a print. I just love love you’re work, the atmosphere of you’re paintings is amazing so many memories of my past, keep them coming, get high quality prints done of these. One question I did have that has confused me beyond belief – In the Albion Pub, 1992 piece, there is an advert for Big Brother. Was that a later addition to cover up another billboard you didn’t like? A real head scratcher! But must distract from my main point: love these pieces! I agree with the positive comments, I think these are a wonderful snapshot of the UK I left behind when I moved overseas. After seeing you on the 6 o’clock news I had to look you up. What lovely paintings many I can recognise from my youth. 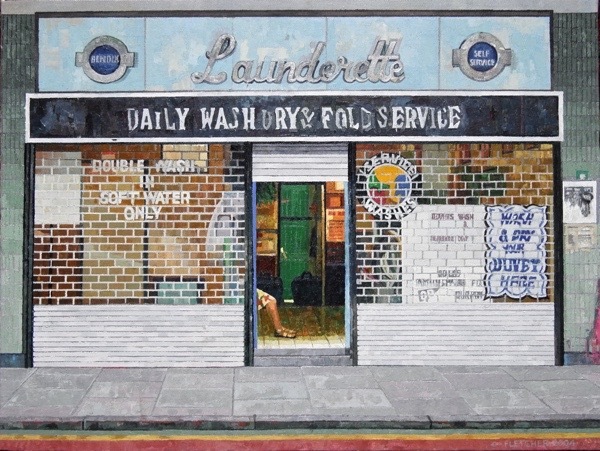 I used to take my washing to the launderette in Ben Jonson Road in the 70′s. Keep on painting Doreen what a talented lady you are.